Jordan’s first National Geographic & PADI 5 star dive center recently opened in Aqaba. Jordan Dive Center, in partnership with Sindbad for Marine Transportation, might be the newest highlight, but rest assured there are many years of experience among the Jordan’s first National Geographic & PADI 5 star dive center recently opened in Aqaba. Jordan Dive Center, in partnership with Sindbad for Marine Transportation, might be the newest highlight, but rest assured there are many years of experience among the staff. It is the high standard that has earned the center this high rating. New equipment, in a variety of sizes and styles, has been brought for up to 20 divers at a time, plus 4 full sets for kids. In a convenient location in the center of the town, a relaxed café atmosphere has been created, with outdoor seating and indoor sofas. All that is needed to arrange your diving and take you through your course is available. This includes access to a heated indoor swimming pool, suitable for the confined water part of the course, and access to the sea on your doorstep; we are located in all the beach front hotels. Being part of a much bigger company gives Jordan Dive Center the added advantage of a variety of boats and possibilities; hard-core diving in 30 ft boats, a 55 ft glass bottom boat allowing viewing for all the family to enjoy, regional and international trips daily on a 65 ft yacht and an exotic, 100 ft sail boat, with enough space for everyone to spread out. The Dive Center Managing Partner is Nabeel Aqbarawi who moved to Aqaba in 1991 and learnt to swim a year later. The following year he had completed his Open Water course and was now on his path of diving. Turning professional with his Dive Master in 1994, he was on a fast track to instructor in 1995. By the time he became a Course Director in 2003 he was certifying over 1,200 students annually. Moving onwards he became a Technical Diving Instructor Trainer in 2005. Deciding that it is time to have his own operation, he joined Sindbad for Marine Transportation to bring the best of both worlds together. Located at the most northerly tip of the Red Sea, in one of the world’s most striking and charming natural seascape environments, Aqaba has crystal clear water. “Diving in Aqaba is so different than anywhere else,” is a general guest comment “rarely are the sites crowded.” You may not see pelagic fish often, but that’s more likely because you have your nose in the coral, looking at the huge variety of unusual fish that are so easy to spot. The diversity of species in the Gulf of Aqaba is huge, around 127 species of hard coral, 350 species of soft coral and around 1,200 species of fish, as well as a thousand types of mollusks and crustaceans, all coexisting since hundreds of years. When it comes to diving most of the popular dive sites are located within the Marine Park. This 7 kilometer stretch, along the southern coast of Aqaba, was established in 1997. Its responsibility is to protect the ecosystem and monitors all diving activity with strict regulations. 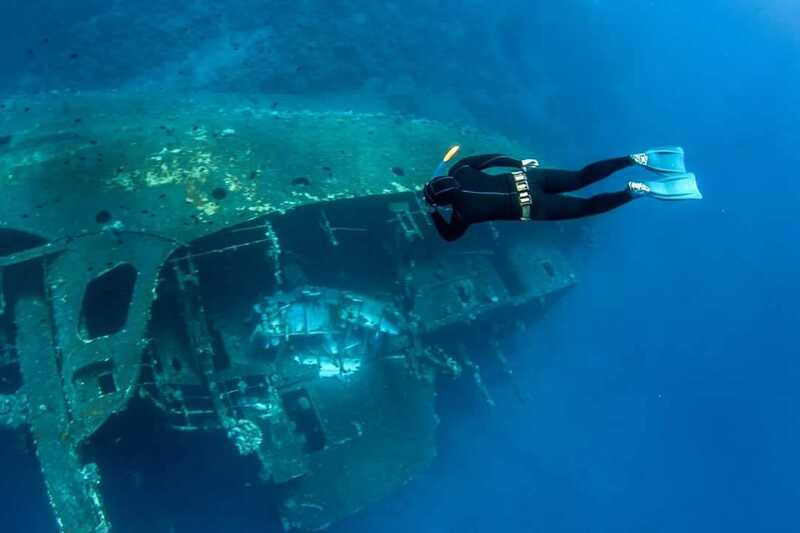 21 dive sites exist within the Park, with the most famous one being the wreck of the Cedar Pride, located at 25 meters depth in front of the Marine Park’s center, it was a Lebanese freighter sunk in 1985 by King Abdullah II. HRH also sank an anti-aircraft tracking vehicle, called The Tank, this dive is at 6 meters. For techi divers there are two special wrecks; The Taiyong & Sharouk, both barely touched and excellent locations for deep diving.